Lenka Dusilova on tour in Washington, DC, June 2004.
a live show in Hillside, IL. Visit the official Playing Field Myspace page at www.myspace.com/playingfieldrecords! Say hello and be our friend! Textbook has been chosen for Q101’s Local Music Mailroom feature on Q101.com. Go and vote for the Textbook song "Better Late Than Never" and the song will get a spin on the station this Friday. Lenka Dusilova will be here in the states for a national tour with award-winning Czech folk artists Czechomor this fall! See Lenka's Tour Page for tour dates, and the Czechomor US Tour site to buy tickets and for complete tour info. It's time to vote for JigGsaw again! They are competing as a part of MTV2's On the Rise competition. Please go here, click on JigGsaw and vote as often as you like! Congratulations to JigGsaw, who has been invited to play the Warped Tour! JigGsaw will be performing at Warped Tour in Maryland Heights, MO, Cincinnati, Pittsburgh, Noblesville, IN, Detroit and Chicago at the end of July. (See the Tours page for specifics). It's voting time for the Battle of the Bands and JigGsaw is in the running! Bands are competing for some fantastic musical gear. Go to JigGsaw's Battle of the Bands Voting page to vote for them. Textbook has once again played musical chairs. Now on guitar left is Scott Ozark formerly of seminal Chicago punks Oblivion and later of The Knobs. Scott is no stranger to the band, having played on the 2002 Textbook recording USED. In addition, behind the kit is veteran drummer Mark Doyle who has graced many stages with Loud Lucy, Verbow, Woolworthy, and currently with The Cells. The current line-up is working on new songs and plan on recording the 4th Textbook CD in late Summer/early Fall. Come say hello and hear some new songs on June 16th at Beat Kitchen with The Mopes (a reunion show featuring members of The Methadones, Screeching Weasel, and The Queers), Shot Baker, and The Holidays. JigGsaw has been entered into the Vans Warped Tour Battle of the Bands! Visit www.battleofthebands.com/jiggsaw and play their songs all the way through to increase their daily plays ranking. The finalists will be selected June 15th. Good luck! Watch the premiere of Lenka Dusilova's new video for the song "Litaci" produced by Ales Suk and Petr Kout on Ocko tv on May 13 at 5:00 pm. Check it out online here: Litaci Video. The long-lost Textbook recording USED is now available via iTunes. The 10 song full-length was recorded in 2002 by Matt Allison (Alkaline Trio, Lawrence Arms) and features Dan Knapik (ex-Not Rebecca) - bass/vocals, Scott Ozark (ex-Oblivion) - guitar, and Matt Montalto (ex-Monster Trux/The Skulls) - drums. Don't miss out on a great record with live staples like Letter Turn, Red Park, and Really, as well as two songs penned by Dan Knapik (currently of Venom Lords and Liveage). In addition, the first release Smoke Em If You Got Em is also available in the iTunes store. JigGsaw's Zero Generation has hit #11 on the charts at WMHD 90.7 out of Terre Haute, Indiana. Check out other stations playing great PFR tunes on our radio page. Textbook is being played on the web-radio show Suburban Hell. The show features bands like The Descendents, Alkaline Trio, The Ramones, Smoking Popes, Superdrag and many more. Listen to the show every Tues - Fri from 4pm - 6pm (CST) at radioguruonline.com. Lenka Dusilova has won Singer of the Year and Album of the Year in the “Andel Allianz 2005” Music Awards (the Czech equivalent of the Grammy) and Album of the Year in the Czech Internet Music Awards. Check out the review of The Great Salt Creek from Pastepunk.com... "The beauty of the Midwest lies in its pure simplicity. TEXTBOOK, a rock band from Addison, IL strives to create music in this same light. It isn’t showy or groundbreaking, the lyrics are free prose, but it is straightforward and honest and for that reason, it is beautiful." Read the full review here. JigGsaw's Zero Generation has hit #30 on the charts at WNEC 91.7 FM out of Henniker, New Hampshire and #13 at WSBU in Saint Bonaventure, New York. Find more stations playing PFR artists on our radio page. JigGsaw's Zero Generation has hit #13 on the charts at WRBC 91.5 FM out of Lewiston, Maine. Check out other stations playing PFR tunes on our radio page. See the gallery of photos of Lenka Dusilova on tour in Chocen, Czech Republic here (thanks to Lucie Sedova). Lenka Dusilova has been nominated for the prestigious music award Andel 2005 (the Czech equivalent of the Grammy) in two categories: Female Vocalist of the Year and Album of the Year. The ceremony will be broadcast live on Czech Public TV and Czech Public Radio at 8pm CET on March 12, 2006. Lenka will perform one song live. Textbook will be featured this coming week on Fearless Radio's New Music Binge. Tune in between 4:00 and 6:00 p.m. CST on Wednesday, February 15th at FearlessRadio.com. Tickets for February shows are available on the Ticketstream website. Tickets for March, April and May will be on sale soon. Happy New Year! Check out Donewaiting.com where Chicago writer Jim Kopeny picked Textbook's The Great Salt Creek as BEST LOCAL RELEASE OF 2005. Big interview with Lenka Dusilova in the January issue of a popular Xantypa magazine. Lenka Dusilova is nominated for the Ocko TV Music Awards in two categories, Singer of the Year and Music Video of the year. Textbook is on the cover of IndiePulse webzine for the month of December. Lenka Dusilova's new music video for the single Vlci Oci is directed by Pavel Sadilek. It's inspired by Dali's lady Mae, and by a longing for return to one's childhood. Playing Field Recordings is proud to announce the signing of Central Illinois' most rocking indie rock band, JigGsaw! JigGsaw is a four-piece based in Champaign, IL. 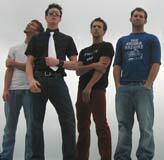 Their 10-song debut album, titled "Zero Generation," is scheduled to be released on January 31, 2006. Local radio stations are already playing tracks from this album, so call and request to hear them. Get more information on JigGsaw. Order CDs and vinyl from Playing Field! We encourage you to buy from the fine music stores worldwide that carry our releases, but if you cannot find our music in a store near you then you can order direct from us. We're working on building a complete shopping cart ordering system to our web site, but in the meantime we have added a printable order form to the store section for you to use. Take a look! Jersey Beat gives Textbook the thumbs up in their recent review of "The Great Salt Creek" CD. The magazine claims that "...the instrumentation present on tracks like 'Dear You, Dear' is intense; with so many layers present, listeners of all types and of all styles will find something to connect with...." Also stated is that "...the energy in which the band opens up the disc, coupled with the smooth, memorable vocals of Dave Lysien is a perfect ploy to draw listeners into the more nuanced style that dominates..." Read the complete review here. 94.7 The Zone is Chicago's New Rock Radio Station and they are playing Textbook! Call the request line and request the song "Take What You've Been Given" by Textbook. The request line phone number is 312-357-9663. Textbook's "The Great Salt Creek" CD has also been played on several other radio stations, including the legendary WXRT in Chicago. Check out all the stations playing our music on the radio page. The new Textbook CD, "The Great Salt Creek" is out now! Great reviews are already coming in. This is one of the best albums ever released on Playing Field Recordings. Get your copy of this first pressing before they are all gone! And go see the band live next time they play in your town! Textbook has once again been invited to play MOBfest this year. MOBfest is an annual 3-day event hosted in Chicago that started in 1997 with the help of some of Chicago's most prolific music industry players. The event showcases dozens of bands at several of Chicago's premier music venues. Some bands that have been invited to play at MOBfest in the past include Assassins, Kill Hannah, The Killers, and Disturbed. This will be Textbook's second consecutive year performing at MOBfest. Very exciting news this month! We have signed a deal with the Chicago-based band Textbook to release a new album. Textbook is comprised of members of the now-defunct classic Chicagoland bands Not Rebecca and Woolworthy. The new album takes that great pop-punk sound you love from Not Rebecca and expands on it by adding elements of roots rock, indie-pop and even classic rock, blended into a unique and engaging midwestern power-pop. The new album is entitled The Great Salt Creek and is scheduled to be released in about two months from today. Recorded by veteran producer John Agnello (Dinosaur Jr., Buffalo Tom, Son Volt, Burning Airlines), this album is simultaneously sensitive and in-your-face. Check out the Textbook band page for more information about the band, and then listen to their song tracks on the audio/video page! Lenka Dusilova's new CD, U n E a r t h E d, is out now! This CD is Lenka's U.S. debut and she will be touring in the U.S. extensively in 2005 in support of the album. Lenka has already done two U.S. tours in 2004 throughout the East Coast, West Coast and Midwest, and is quickly acquiring a large following of fans who love her haunting vocal talent and intriguing songwriting. The response to Lenka's music in the U.S. has been so great that she is already recording her next album. The album is being recorded at Coast Recorders Studio in San Francisco with producer Ben Yonas (other notable artists that have recorded at the studio include U2, R.E.M., Alice Coltrane, Bill Laswell). Lenka is recording with a "dream team" of musicians, including Tori Amos' bass player Jon Evans. But in the meantime, check out Lenka's latest album, U n E a r t h E d. Out now! New web site released! That's right, after all these years, we have finally upgraded our web site. We've done our best to make it easy for you to find what you are looking for, and to include plenty of good things that you want. We're still adding to it, but we'd love to hear your feedback on what we've got so far. So let us know what you think, and let us know if there's anything you want us to add that we haven't added yet. This web site is for you, so tell us what you want! Lenka Dusilova is embarking on a special acoustic tour to the U.S. from Oct. 12 through Nov. 22. Check the tours page for tour dates and additional information. This is Lenka's second U.S. acoustic tour this year, and if you missed her the first time you will definitely want to catch her this time around. Lenka puts on a great show with an excellent and unique performance. Don't miss it. She will be in New York, Washington D.C., Illinois, California and Arizona. We have signed a deal to release the U.S. version of Lenka Dusilova's "Spatřit Světlo Světa" CD. The U.S. release will be titled "U n E a r t h E d" and is scheduled to be released on November 9, 2004. Lenka Dusilova is one of the Czech Republic's top indie rock artists, and has a sound similar to P.J. Harvey (for lack of better comparison). She will make an excellent addition to our line of releases from the top indie rock artists around the world. Take a look and a listen and let us know what you think!